Four boroughs more than doubled cycling to work from 2001-2011 according to Census data. 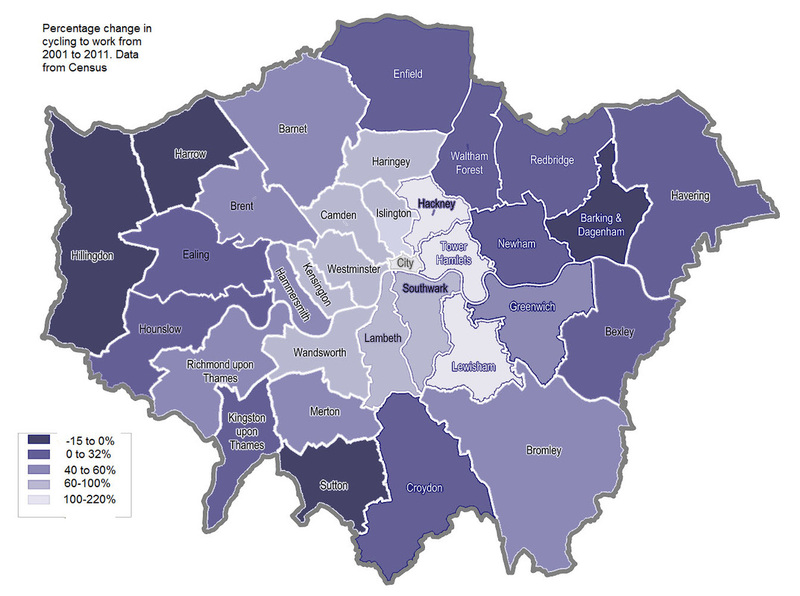 The City showed the biggest change (+212%) followed by Hackney, Tower Hamlets and Lewisham. In contrast 4 boroughs had a fall in cycling to work, Sutton, Hillingdon, Harrow, and Barking & Dagenham. Overall there is a clear concentric pattern with inner boroughs showing large increases and outer boroughs small increases or falls. Note these are % changes. The absolute increases are greater in those boroughs with a high 2001 level, such as Hackney and Islington. Although % increases are high in City and Tower Hamelts, absolute increases are smaller as they start from a low base in 2001. Data on actual levels is in the spreadsheet below. Note that overall London showed a much larger increase than the rest of England, where cycling to work actually showed a small fall.